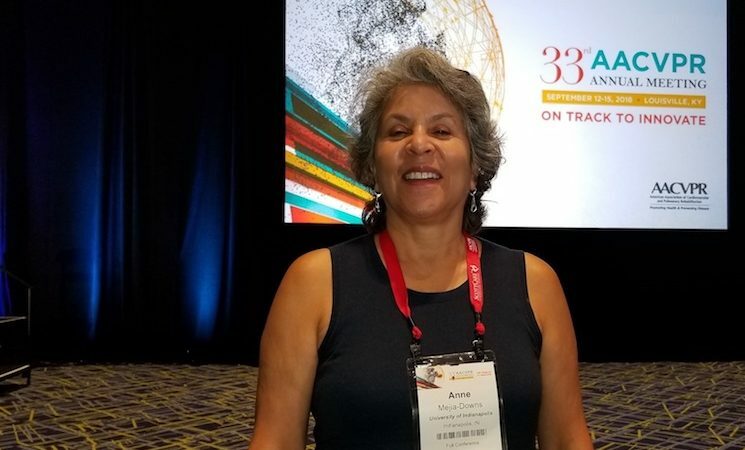 When Dr. Anne Mejia-Downs is not teaching in the University of Indianapolis Doctor of Physical Therapy program or working as a physical therapist in the cardiopulmonary intensive care unit at IU Health-Methodist Hospital, she is in demand as a presenter on the topic of resilience. Mejia-Downs speaks all over the country on resilience as a key factor of wellness. She said she became a student of resilience at the age of 50 in the first class of her PhD program. According to Mejia-Downs, resilience includes both bouncing back from stressful experiences and moving forward from those experiences. She combined her interest in resilience with her expertise in physical therapy in her Doctor of Philosophy dissertation, “An Intervention Enhances Resilience in Physical Therapy Students.” She said people have to learn about why stress is so bad for them to know why resilience is so good. The physiological effects of stress over long periods actually causes damage to our DNA, she said. Chronic stress has been shown to shorten the telomeres on DNA, which is the same process that bodies naturally go through in aging. Stress accelerates that process. Resilience short-circuits the effect of the stress, providing physiological benefits. Research shows there is no gender difference in resilience, but that older people tend to be more resilient, not because of their age but because of their life experiences. She encountered her own test when she was diagnosed with cancer in 2011. When she got sad or angry during her cancer treatment, Mejia-Downs allowed herself to cry or yell, but limited it to five minutes, then tried to focus on the positive. Mejia-Downs said there are three key things people should know about resilience. No matter how much resilience you have – or don’t have – you can increase it, but it takes practice. The more positive you are, the more resilient you are. The most important way to increase your resilience is to strengthen your social support. For mini-activities in increasing resilience, Mejia-Downs recommends a book called “The Bounce-Back Book,” by Karen Salmansohn. Mejia-Downs takes her message about resilience to health care practitioners and other groups who request it. In addition to several student groups at UIndy, she has presented at the North American Cystic Fibrosis Conference, American Physical Therapy Association’s Combined Sections Meeting, American Libraries Association Midwinter Meeting, and California Physical Therapy Association Annual Conference.